UPDATE: The death toll has now been changed to 31. Terrorists have staged a massive attack at Istanbul’s Ataturk airport. Suicide bombers managed to kill at least 31 people and up to 60 more were wounded. Suicide bombers have killed at least 10 and wounded 40 at Istanbul’s Ataturk airport after blowing themselves up as police opened fire, according to Turkish officials. It is understood that a ‘terrorist’ first opened fire with a Kalashnikov and became involved in a shoot-out with security personnel before blowing himself up. One eyewitness reported seeing a police officer wrestle the attacker to the ground in the midst of the melee, before the explosion was detonated. Turkish Airlines is the official airline partner to the Euro 2016 football tournament, being held in France. It is believed the suspects had been trying to pass through the x-ray machines at the International Arrivals Terminal when they were stopped by security officials. They then opened fire and became locked in a shootout with security and police officers. Some of the wounded are said to be police officers involved in the melee. The first photographs to emerge from the airport show a scene of devastation, with debris and what appear to be ceiling tiles scattered over the taxi ranks outside the airport. 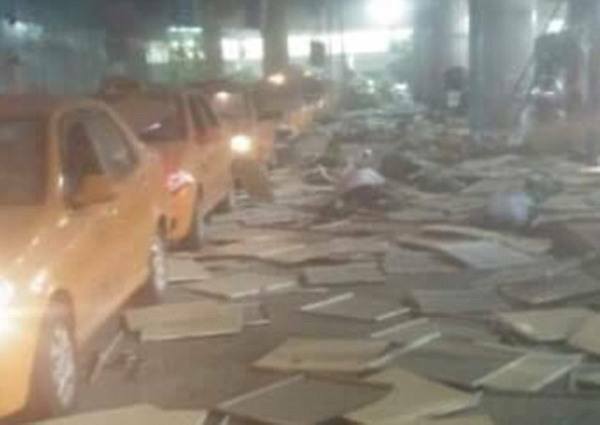 At least 10 people were killed and dozens more injured when two suicide bombers attacked Istanbul’s main international airport Tuesday night. Turkish Justice Minister Bekir Bozdag confirmed the death toll from the blasts at Istanbul Ataturk Airport. Bozdag added that “around” 20 more people were wounded, but Turkey’s state-run Anadolu news agency later reported that around 60 people were injured, six of them seriously. “According to the information I was given, a terrorist at the international terminal entrance first opened fire with a Kalashnikov and then blew himself up,” Bozdag told Turkey’s state-run news agency.